Enter by commenting below or by writing us on Twitter @Retro1951. Each person who enters will be entered into a drawing to win one of (6) Croco Tornados. One entry per person. Contest ends this Saturday, March 17 at Midnight. May the Retro 1951 Fairy be good unto you! Wherever you go and whatever you do may the Guinness flow freely, and may there always be a pot of gold at the end of your rainbow. May you have the light of inspiration and a pen to guide you. I hope I’m lucky enough to win! LOVE Retro51!!! May pen and paper go with you too. And your pens never clog! may God and this pen be with you. May your ink flow freely (preferably blue). But here’s hopin’ a Tornado will pop up in my ‘hood! Or a green croc Retro that will NEVER get old! May a Retro51 be right there with you! and may health, wealth, and happiness always abound, too! 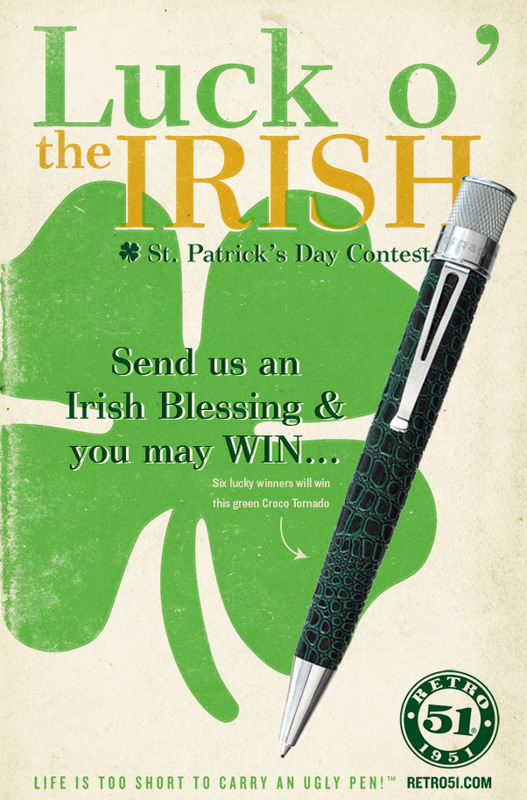 May the green Retro pen write blessings to you. On this our 28th wedding anniversary! May your rainbow of Tornados write it for you! … a fountain pen, nibs, and ink be with you. May God bless you with the ability to write, to inspire others and to make dark things light. May He also hold you in His care, and may quality, heavy writing paper also be there. Third is the Disney that grow on you too. That I do love and adore! …your Retro Tornado keep writing for you! May you be blessed with wild, creative thoughts and a cool Retro 51 pen to inspire you. May your records of thought be written true.